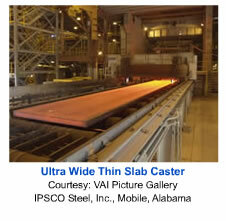 Walking Beam - Steel is actually raised up, moved forward, and lowered back down in the furnace. In this manner, material is "walked" through the furnace. Rotary - Circular in design. Steel is placed into the furnace on a hearth that rotates and the material is heated as it travels on the hearth. Reheat furnaces at mini-mills generally utilize natural gas fired burners (although some limited induction systems have been utilized). Reheat furnaces in integrated steel mills also use natural gas fired combustion systems. However, where coke oven gas is available, it is common to use coke oven gas in one or more heating zones or to mix natural gas and coke gas in all firing zones. 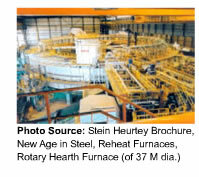 Pusher furnaces are the most common type of reheat furnace used by steel companies. However, for the more recent installations, walking beam furnaces are more commonly specified. Reheating can also occur during the rolling or shaping process. Special edge heating stands for strip, slabs or long bar products have been installed. In this area oxy-fuel natural gas systems have been demonstrated and can effectively compete with induction. Hot rolling of steel is generally accomplished at temperatures in the range of 2,000 to 2,200°F. Traditionally, a significant volume of natural gas has been consumed in reheat operations. Many older pusher and walking beam furnaces have been upgraded to meet higher productivity needs, to lower energy use and to reduce emissions. Continuous pusher furnaces are generally both top and bottom fired (burners located above and below the hearth line) and equipped with a water-cooled and insulated skid support system. The chief disadvantage of a pusher design is that the skid system (that the steel being heated slides on) will cause cold spots (skid marks) to form on the bottom of the steel being heated. These marks, if not minimized, are detrimental to the subsequent rolling or shaping operation. Walking beam furnaces also utilize top and bottom firing. However, they stagger the location of the support beams and, therefore, reduce or eliminate colder areas. Also no skid marks are created. Additionally, unlike pusher furnaces, which allow cool spots to form where they push against each other; walking beam furnaces keep billets separated. Natural gas consumption will vary based on the material size (thin slab versus thick), if the material is charged into the reheat furnace cold or if a hot charging practice with shapes direct from the continuous caster is used, and how well the equipment is operated and maintained. A photograph of a thin slab emerging from a caster is shown to the right. Current practice is to locate an equalizing (or tunnel furnace) close to the exit point of the caster.